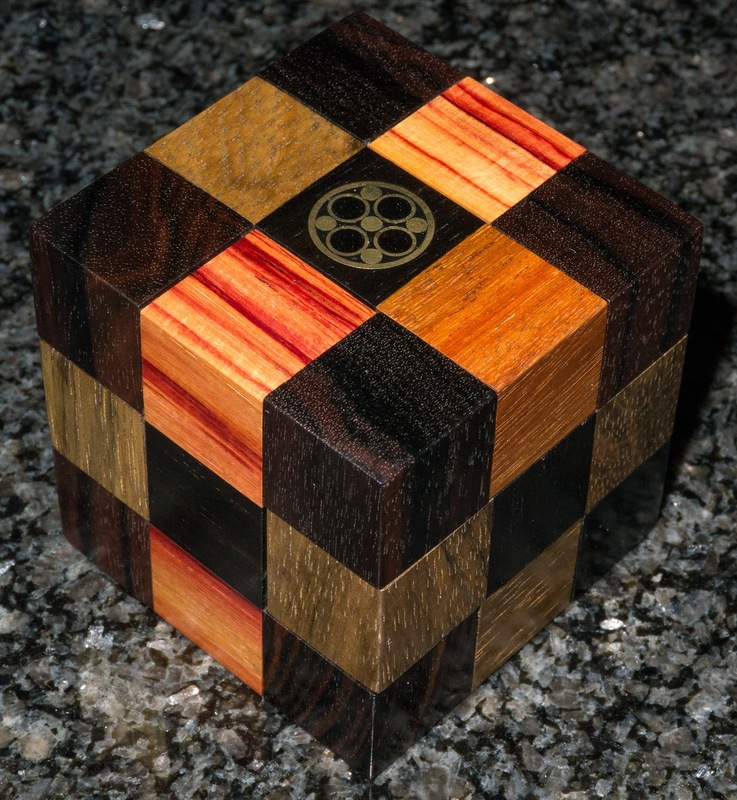 PuzzleMad: How many more N-ary puzzles do you need? 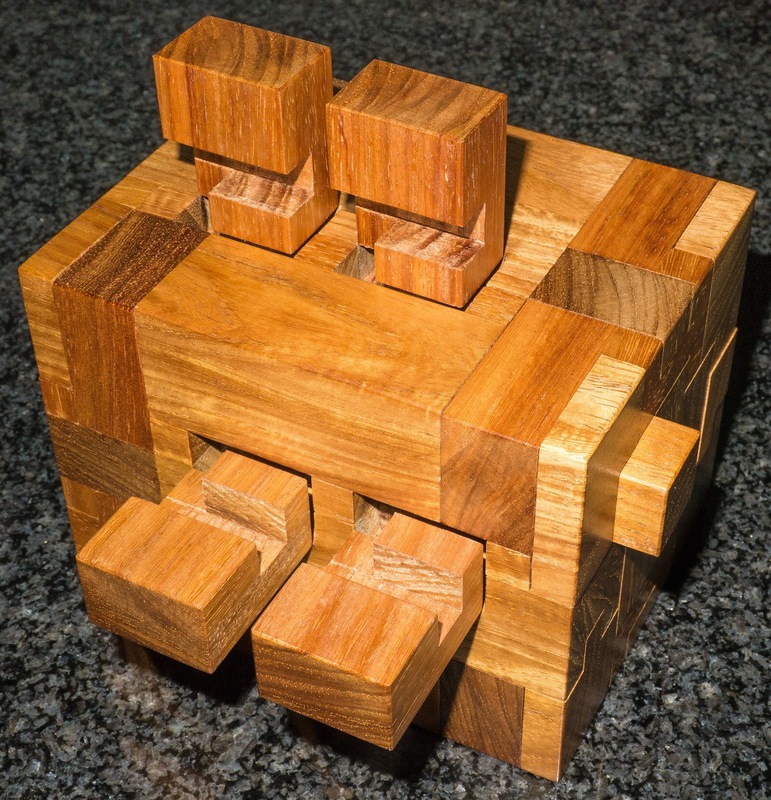 Today I want to tell you about some of my all time favourite puzzles - they combine maths, beautiful wood and puzzling. I want to start with a classic puzzle which has recently become available again and I think you should really consider picking up a copy. Following that I'll show you a few others in my collection. Here you can see a brand new production of the Hexadecimal puzzle. The puzzle was originally made for one year only in 1986 by Binary Arts (now called Thinkfun). In that year 7500 were produced and only about 750 are estimated to still exist, most firmly in the hands of puzzle enthusiasts/collectors. They seldom come up for sale and command very silly prices. My good friend Michel has been searching for one for years and only recently managed to get hold of one. 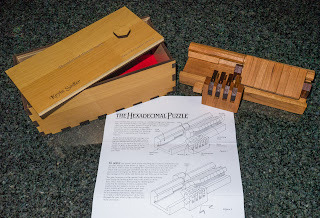 He informed me that Dave Janelle of Creative Crafthouse has obtained permission to produce a limited run (max 190 copies) of this fantastic puzzle for us dedicated puzzlers. He has made them beautifully in Cherry and they are pretty much identical to the original. They are engraved, numbered and presented beautifully in a lined presentation box. The documentation includes that which came with the original puzzle. I managed to get number 6 which is the first to go to the public and can absolutely vouch for the quality and the puzzle enjoyment. They are available here for a very reasonable price. It was designed and patented by William Keister (1907–1997) in 1986. William was an engineer in the famous Bell Laboratories and one day he raided the Bell Labs’ stock room, gathering up pushbuttons, electronic relays, and light bulbs to build an electronic version of the Chinese Ring Puzzle. 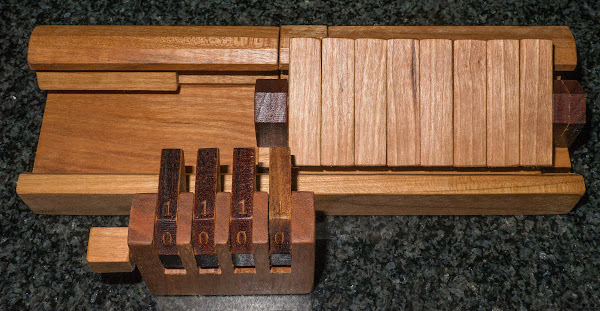 After a few hours work, he realized he had wired it up wrong, but studying what he had done he also realized he had stumbled upon a whole series of binary code sequence puzzles, of which the famous Chinese Rings Puzzle was just one variation. He went on to sketch out a whole series of logic puzzles and show how they could be solved mathematically with Boolean algebra, a precursor to today’s computer languages. It consists of a sliding carriage and a stationary base. The carriage is fitted with 8 rectangular switching bars which can pivot on their centres to angle in either of two directions. 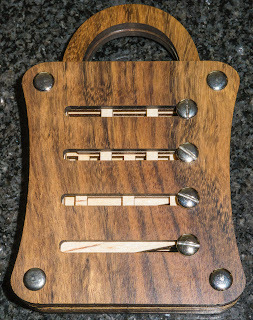 The base, which holds the carriage during the puzzle’s operation, is fitted with an assembly containing 4 blocking keys. These keys can be present into any one of 16 positions. The object is to remove the carriage which contains the 8 switching bars. By setting the 4 the blocking keys in various initial configurations, there are 16 puzzles to solve ranging from fairly easy (8 moves for position 1111) to extraordinarily difficult (170 moves for position 1110). It has been analysed (just like most mathematically based puzzles by Jaap here. Let me say that whilst I love Gray code puzzles and find most of them fairly easy, this is really taxing me! I have only done the first 6 so far and am very much enjoying it - you should really consider getting a copy because once this run is over, it is highly unlikely that they will ever be made again! If you do own an original or buy one of Dave's excellent copies then it would be a great idea to enter your name onto the Hexadecimal hall of fame which is being kept for the world by Richard Whiting. See the list of owners here and toward the bottom of the page he has a link to email him to inform him of your acquisition. 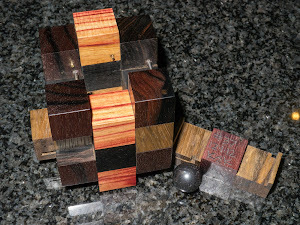 Richard also has an info page about these puzzles here. Some time ago I discovered the delights of recreational mathematics and to help me do it better I even started a Maths degree with the OU! Sad and geeky I know but great fun! Unfortunately, the time required for the degree got in the way of "life" and after 5 years I gave it up. I'm now left with recreational maths books everywhere and an urge to do some more! But one look at the present Mrs S and I realise that my puzzle hobby will have to be the only one! Can you smell burning flesh too? So I am left with an enjoyment of maths and puzzles and wondering how I can combine the two into one hobby. Over this last three year journey, I have found a group of puzzles that I absolutely adore for this very reason - they are the group of puzzles called "N-ary" which are based on Gray code. The classic 2 in this group would be the Towers of Hanoi and the Chinese rings of which I am ashamed to say that I only own the latter. Goetz has written a brilliant analysis of this group of puzzles and made it freely available - download it here. After the Chinese ring puzzle, it took a while before I decided I needed any more and have recently noticed it take off and I have quite a lot now. 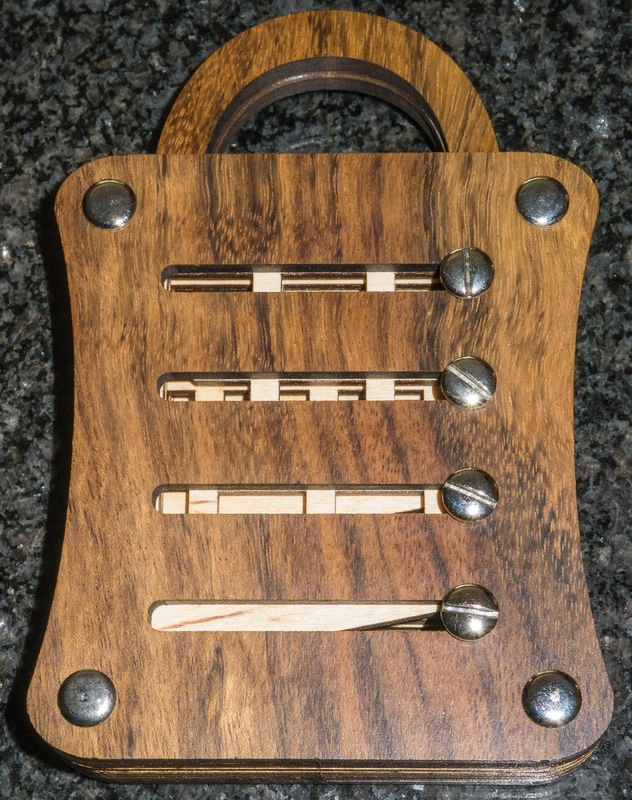 A few to recommend to you include the Kugellager 8 (available from Tomas at Sloyd here) which combines a quinary puzzle with some dexterity as you need to slide the ball bearings back and forth. Or for added fun due to the requirement for 4802 moves to solve try the septenary Kugellager 7!!!! (I think this has to be purchased form Wil Strijbos). Heaven help you with that one if you get turned around and don't realise it half way through your solve! These whet my appetite for more and next from Wil I managed to get a copy of the Schloss 250+ which combines something rather pretty with a 6-ary puzzle! It's not difficult but is really a very nice sequence and is fun to do! For me it is almost a "worry bead" - I find myself repeatedly opening and closing it! and if you are really bonkers then you might like to buy the generation lock from Wil which has an identical design but has many many more sliders and positions and Goetz (the authority on these) calculated it as having 341 million moves to solve - hence it will take more than a generation to solve! Allard has described it and how I fell into the trap here. The latest one I obtained from Wil has been the "6 bottles" puzzle - again analysed by Goetz who has decided that it is a ternary puzzle - I enjoyed it very much! All of these are very reasonably priced. Finally, just to tantalise you, one of my absolute favourites combines a burr and an N-ary puzzle! I don't own one --- YET. But I managed to borrow this for a month or so from a very good and trusting friend (Thanks Steve!) - it is the famous Ternary burr designed by Goh Pit Khiam and masterfully made by Brian Young. We are all hoping that these are going to be made again by Eric Fuller! I am indeed making a run of Ternary burrs, and am just wrapping up a run of the Binary burr. These will be available on cubicdissection.com very soon! I can't wait, I can't wait, I can't wait!!!!!! Your site is essential reading! Thanks for all your analysis. There's one mistake in your post Kevin. The original hexadecimal was indeed marketed in 1986, but since the patent was filed December 11th, 1970 and awarded January 25th, 1972, the design is at least 16 years older than mentioned in your description! Think about were the world was in terms of computers back than and try to imagine coming up with this design! of course a very nice piece on n-ary puzzles kevin, keep it up!